Site-specific artwork, art in public places program. 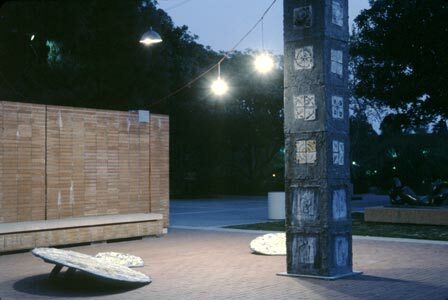 Mixed media sculpture for building facade in Hollywood California, 1994. 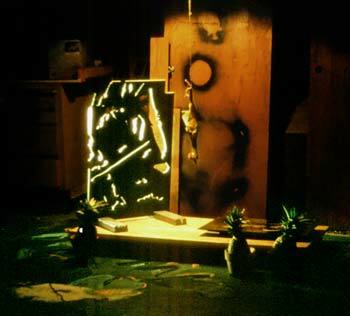 Sculpture, Site Specific art, installations, art in public places by Mike Roy. 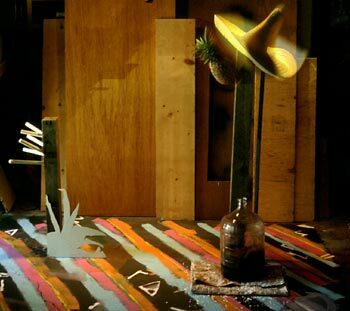 Guitar Center, Disco Unit, painted sculpture, annunciation, cherub trap. Disco Unit Sculpture, 1979. Mixed Media. 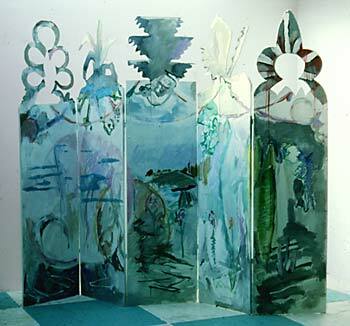 Room Screen, 1982. Acrylic on wood. 120" x 96"
Operating instruction: the rubber chicken (a primal form of life) lures cherubs and other orders of angels to see their own image in the mirror. 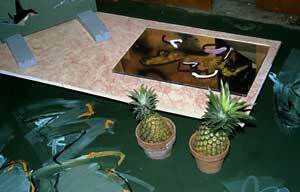 Pineapples further sweeten the bait. As cherubs approach they become entangled in the cut-work of the standing panel, and are trapped, allowing further examination.